Brussels Gallery Weekend kicks off with over thirty openings and events beginning on September 8 and running through September 11. Some things to look out for during the four-day event include American artist Lynn Hershman Leeson in group show Wait for Me at the Bottom of the Pool at Gladstone Gallery and London-based painter Merlin Carpenter‘s solo exhibition Blogs of the Near Future at dépendance. Italian artist Giuseppe Stampone’s first Belgian exhibition Europe vs Europe opens at Marie-Laure Fleisch, while other venues too look out for over the weekend include Sorry We’re Closed, Deborah Bowmann, Island, and more. Some satellite events include Komplot’s 5EVER Summer and the Institute for New Feeling presenting ‘A Collection of Air Qualities’ — a designer fragrance’ “derived from a playful balance of garden herbs with airborne pollutants and human essences” at Parc Duden, hosted by Jardin Essentiel, Parc Design. 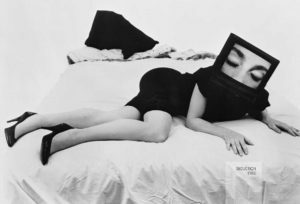 Lynn Hershman Leeson, ‘The Electronic Diaries’ (1986-1994). Courtesy the artist. Oscar Tuazon‘s solo show General Contractor is on at Brussels’ dépendance, opening April 20 and running to May 25. 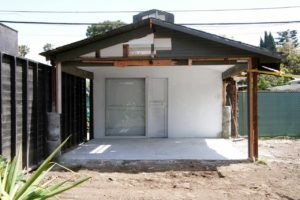 The LA-based artist uses construction sites, materials and processes to inhabit space, be it by flattening a small house, by coming upon moments construction or by building beams in to a space. 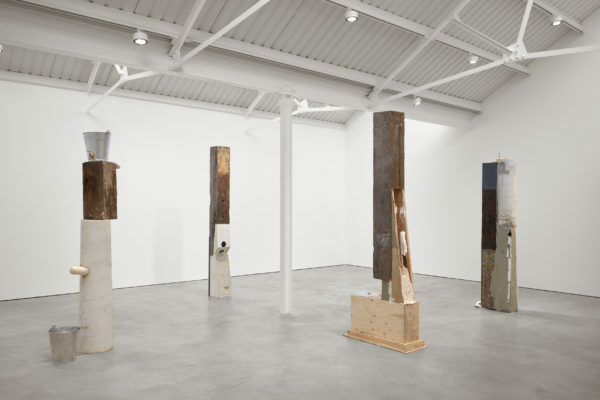 At London’s Modern Art, Tuazon’s beam structures were inhabited by holes and poetry by Ariana Reines. There is no information to accompany the coming show at the Brussels space, but we are teased with an image of (presumably) the same house Tuazon pulled down in a recent exhibition at Paradise Garage which aqnb reviewed last year. The windows and door are closed, leaving us to imagine what inhabits and what will inhabit a show whose title references the position of someone able to provide permission to perform labour and change a space entirely. General Contractor coincides with the Art Brussels weekend coming up. Ariana Reines + Oscar Tuazon, PUBIC SPACE (2016). Exhibition view. Courtesy Stuart Shave/Modern Art, London. Ed Atkins’ ‘Hisser’ is inspired by the true story of a man in Florida whose bedroom fell into a sinkhole that opened suddenly and was never found. The immersive dimension of the exhibition consists two-channel video with multiple audio channels and mixed media. It presents at Brussel’s dépendance, running October 31 to November 28, and almost constitutes a closed box. Entering the space from the back of the set, the viewer finds themselves facing the double video display, giving it the sense of looking at oneself in the mirror. Before walking in the installation, a quotation by famous American writer and activist Helen Keller -printed on a poster representing a wolf’s head -warns us, “Avoiding danger is no safer in the long run than outright exposure… Life is either a daring adventure or nothing”. It is the same poster which is pinned above the bed of the character in the ‘Hisser’ video whose bed (and life) is on the brink of collapse into a sinkhole. Inside, the high definition video plays concurrently on two large projections and shows the inside of a man’s bedroom, which in turn tries to show us the inside of him. The scene takes place at night, windows are opened, curtains are shaken by the wind. The bed is sometimes empty, sometimes occupied by the man in the grip of the sadness, anxiety. Talking to himself, inhaling, panting; sometimes he tries to fall asleep, to calm his spirit. “I’m sorry, I didn’t know”, the digitised voiceover says. Ed Atkins, Hisser (2015). Exhibition view. Photo by Sven Laurent. Courtesy dépendance, Brussels. Stretched out with eyes open in his white sheets, sat in front of his bedroom door, or going through forms sketched in ink on pieces of paper like a kind of Rorschach test, we are the whole inside his body, merged with his corporeality, devoured by it. The fuzziness of the image picked up by a subjective camera could be his view blurred by tears. An oppressive sound heard as if underwater could also be his breath. Another sound, of a hard drive or software repeats throughout in the film. We could ourselves become his random access memory. Realised in CGI and animation, ‘Hisser’ questions the successive breaks at work in the equation of representation and technology. Between full technological power and human failure, ‘Hisser’ shows a character at the heart of a universe of mold-able movie effects, where in their emancipation they are also paradoxically prisoner of themselves; of a human condition, a psychic wandering. If physically this wandering is not limited to the space of the huge white desert landscape where the character finds himself walking naked at the end of the film, it indeed finds its breaking points in the story: when the rooms collapses, when the man kind of cries looking at the viewer from his bed. The video and audio also breaks in the image editing and sound treatment; effects which tremble or split into halves and a sound that is suffocating. It’s a reality which twists itself, which repeats itself, as a mirror of itself as well. Ed Atkins, ‘Hisser’ (2015). Install view. Photo by Sven Laurent. Courtesy dépendance, Brussels. Atkins uses modern tools and forms to produce a film which plays on a tipping point between the ultra-presence of the image and a total wandering; a perdition, a quasi-disappearance of a character in the grip of doubt, fear, loneliness and death. But in spite of this ampleness of device, it makes the process of compassion just as extreme, a kind of existential vacuity persists. Because it is indeed the failure which is at work here. It’s something that is controlled by the digital tool, but how is it embodied in the image? How does the feeling of the protagonist reach us? How can all our psychic suffering -which make us human – be at work in this hyper-realistic representation of this man? Ed Atkins Hisser was on at Brussels’ dépendance, running October 30 to November 28, 2015. Header image: Ed Atkins, ‘Hisser’ (2015). Install view. Photo by Sven Laurent. Courtesy dépendance, Brussels. European Pop and media art pioneer Thomas Bayrle presents a solo exhibition at Brussels’ dépendance, opening September 11 and running to October 17. Described as “the perfect unknown artist” the serial repetition of Bayrle’s defining 60s works as an emerging Minimalist in graphic art is still active. He’s a Frankfurt-based artist who is and was both art producer and Professor at the Städelschule from 1975 to 2007, and employs methods and media that present a critical engagement with new visual languages that respond to the contemporary moment.